Spring is here – the robins are here – the cats are – hey! leave that bird alone! Ah spring is in the air. Picnics are taking place in the park, lovers stroll along the beach hand in hand. I, on the other hand, am wildly chasing cats who are wildly chasing birds. Its enough to drive a person crazy. I realize cats are doing what they do, the hunt, the feast, the ….mess. And I’m doing just what *I* do – save all the little animals. To such an end, I’ve bumped up the daily requirements of catfood, as they always say a well-fed cat won’t catch any mice! But, it doesn’t work with birds. One morning, on a blurry eyed trip to the bathroom, I caught a flutter of wings. My sweet baby Oscar, looking more like a Vampire Cat, had somehow managed to bring in a fairly large bird through two cat flaps, down the hall and into the bathroom. The bird was flapping, the cat was hissing and I was screaming. The bird was safely let out the front door. Whew. Catzilla has on occasion brought in a hummingbird and once a bat. Again with the screaming and the escaping. Bear brought in a pheasant. I mean seriously? A PHEASANT??? What’s a cat owner to do? 1. Keep the cats inside by locking down the cat doors. Yes, this will involve over 6 months of weeping, clawing, semi-rabid cats attempting to escape. 2. Chase the birds away. I have NO idea how to accomplish this one. If they’re silly enough to land in my yard that is virtually COVERED in cats, they’ve obviously earned the “bird-brained” award. 3. Muzzle the cats. Ummm….only if a hospital was nearby for transfusions. 4. Spread buckets of bird seed at my neighbors house – they gave us their cats, they can have our birds! Frankly, there’s just no way to stop cats from being cats. Or to stop birds from being birds. Which leaves me, the Crazy Cat Lady, having to be fleet of foot trying to rescue any little chicks that might cross my little kitties path. Fly free, little chickadees – over to the neighbors!!! Waaaaaay back when, when I first decided to become a *cough* writer, I KNEW my stories would have pets in them. Cats, dogs, frogs – an iguana. Didn’t matter, there would HAVE to be some kind of pet in the story. Possibly it’s because I’ve lived my entire life with pets. Either my own, my parents or someone in my family has always had a pet even if I didn’t have one at the time. I can’t possibly imagine someone in one of my stories not having one as well. There’s a variety of challenging problems that come with writing a romance while the hero and/or heroine has a pet. 1. They can’t go on exotic vacations – without finding a pet sitter. 2. They must have quality time with their pet – without the pet taking over the story. 3. They must share their innermost feelings with their pet – without looking psycho. 5. They have to show they can understand their pet – the lifted brow, the sharp bark, the paw on the leg. A bit like when Lassie gave a bark and everyone knew immediately Timmy had fallen in the well. Again. On the other hand, pets can be used to ratchet up tension, especially if the pet hates the hero/heroine. Or if they become ill. Or pet-napped. In one of my little short stories, the dog leaps in front of a car to save the little girl, and ends up with a broken leg. It honestly makes me tear up right here just typing this! But of course, the dog is fine, a lady veterinarian just happens to be RIGHT THERE, and she’s beautiful, and he’s handsome and…well, you can just see the HEA can’t you? My first stories featured cats. Of course. =) Each of my cats will feature in a story at some point. However, my latest also features a bulldog. With a lisp. =) I haven’t actually written one with an iguana as of yet, but when I come up with an appropriate plot, nothing will stop me I guarantee you! I have a YA that features a yak. There will also be horses, possibly an enormous goldfish, possums and . . . well, the list goes on. Do YOU use pets in your stories? If so, what are some of the challenges you’ve run across writing them in? Maybe a story with a ring-tailed lemur . . .
We all talk to our cats right? Right. Even if you said wrong, I won’t believe you. So there. Some cats meow when their water dish is empty or the kitty litter is full. One of my cats will flip the water dish with her paw, bang-bang-banging it until someone fills it up for her. Cats can make over 100 different vocal sounds from meows to purrs to quacks. Yes, one of our cats can quack. What are some other ways cats communicate? Meowing is actually a response cats learn so they can talk to US. Crazy eh? Oh, and for your information, dogs can communicate too! Umm…mostly about food. =) Does your pet communicate with YOU? Christmas for cats is an entirely different matter. 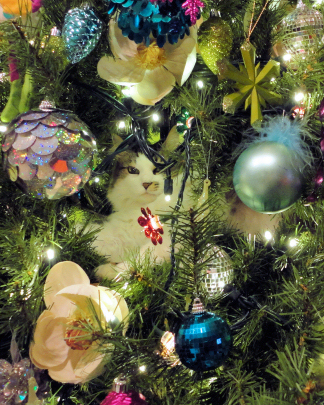 Tinsel, sparkly lights, greenery – it’s a virtual amusement park for the kittehs. But, I’m here to help you celebrate the season with your cats. No, no need to thank me, it’s the least I can do. Just click on the pics to be taken to the site. Let’s start with wallpaper for our computer. 5 absolutely adorable darlings (4 of whom look like mine!) dressed for the holidays. It’s a free download, and your kitties will enjoy having a peek at it while they stand between your keyboard and your monitor. Take a peek at this absolutely hysterical photo album of how to put together a Christmas tree with two cats named Iris and Fern. Just skimming the pictures is worth a giggle. You’re definitely want to send out greetings cards. Make sure you sign them with your name, and then all of your cats names as well. If you can add in the glittery paw prints next to each name? so much the better. Your friends and family will love that you’ve taken the extra time and effort. Make sure you use only the best in Christmas ornaments. Cat shaped ones are super cool, but if you can find live mice? So much the better. The cats will really enjoy decorating the tree with you! You’ll want to make sure you dress your little darlings appropriately for the holidays. 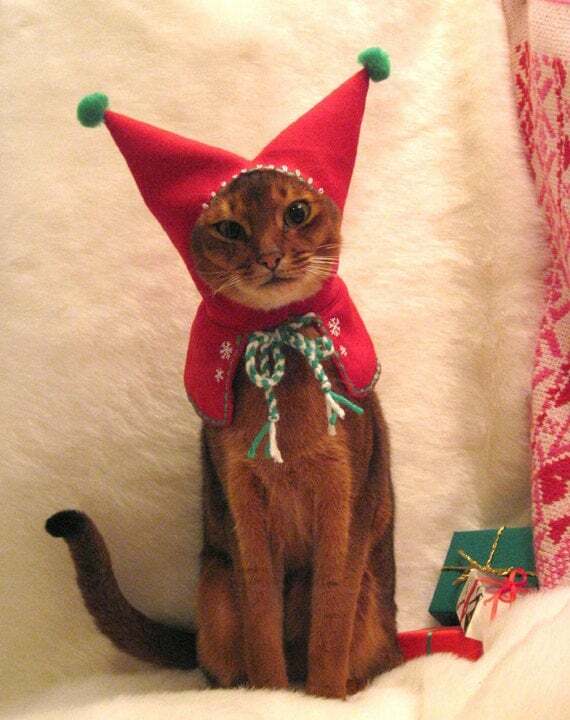 Cats LOVE being dressed up in hats and silly pretty outfits! Um..just make sure you’re wearing protective gloves yes? This wool embroidered Meowy Christmas Holiday Elf Hood from Etsy includes a free catnip toy too! 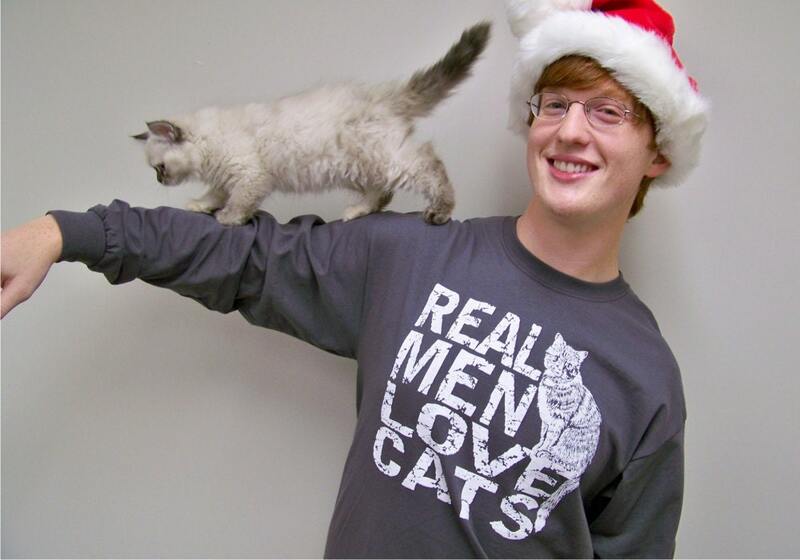 Get your spouse in the Cat Christmas Holiday Spirit! Again from Etsy – what man wouldn’t want to wear this? Brighten it up with a nice tie and he could even wear it to WORK! Finally, wrap up your holidays with treats. Technically, this is a birthday cake, but I think with a little imagination, it can be a wonderful holiday treat! It’s available in tuna, mackerel and salmon. And for the finale, which EVERY SINGLE HOME IN THE WORLD NEEDS: ahem. The Crazy Cat Lady action figure. Not only does she have SIX cats (just like moi) but she’s also in slippers, fleece pants, a park and has a somewhat insane look in her eyes. Not only that, purchasing the Crazy Cat Lady Action Figure helps with the Big Cat Rescue Foundation. There now! That wraps things up! Except for this little tidbit from my own wrapping excursion this weekend. Oscar playing in the paper, my attempts to cover the claw marks and then — retribution. Aren’t they just adorable? Yes, Crazy Cat Lady enjoys dogs as well. As a matter of fact, CCL will be writing a dog book in the next year. For small children, ages 3-7. Digitally illustrated, approximately 24 pages long. She’s absolutely thrilled to death to be working on the project with her mother. 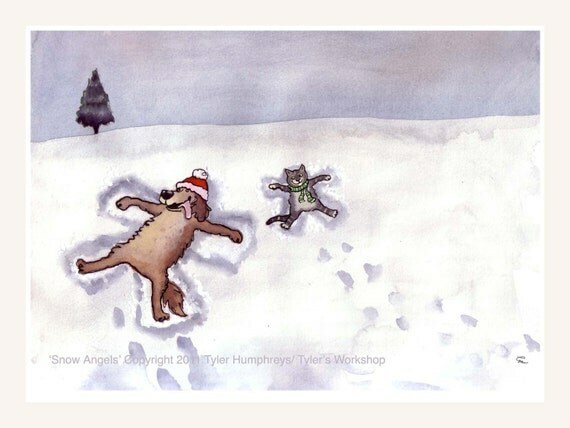 The story will be about a yellow lab who moves to her new home in Iowa, and her first Christmas there. It will only be locally available, but CCL hopes it does well in sales! I’m sure you’ll be hearing more about the project as we work through the storyline, and those of you with small children may be suckered into asked to share bits with your children to see how they react, if the words are too big etc. Looking forward to a great new project!